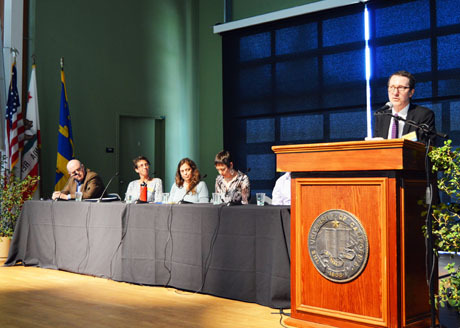 UC Santa Cruz professor of ecology and evolutionary biology Mark Carr moderated a panel on "Coastal Resilience: Weathering the Coming Storm" with, from left, Eron Bloomgarden, Kerry Emanuel, Susanne Moser, Rob Young, and Charles Lester. Daniel Press, UC Santa Cruz professor of environmenal studies, led a discussion of "wicked tradeoffs" with, from left, Dan Schrag, Rentata Brillinger, Lara Jansen, Ellen Hanak, and Noah Diffenbaugh (hidden behind the lecturn). 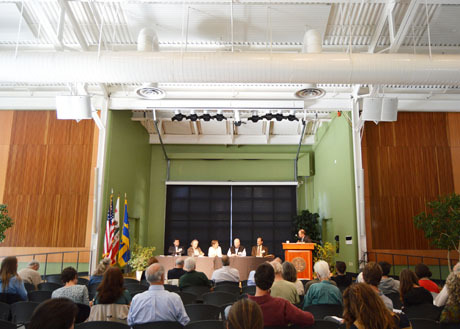 Most of the discussion at the second annual UC Santa Cruz Climate & Policy Conference was not about how to reduce greenhouse gas emissions, but about how to plan for and adapt to the inevitable consequences of those emissions, which are already changing the climate. 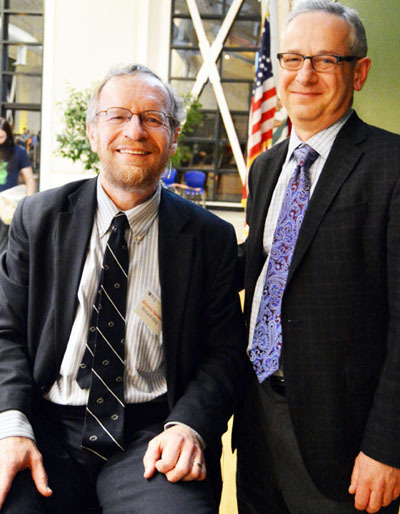 In his keynote speech Friday night, Penn State geologist Richard Alley provided a compelling overview of how our society's reliance on fossil fuels for energy is driving climate change, and he described how costly the impacts of global warming will be, in both economic and human terms. Alley also made the case that the technology is available now to make the transition to a sustainable energy system, and that it makes sense economically to do so. "If you just look at dollars and cents, the economy is still better if we start to wisely reduce our use of fossil fuels," Alley said. "Dealing with it makes us better off–it gives us a stronger economy and more jobs." The transition will take time, however, and in the meantime carbon dioxide from the burning of fossil fuels continues to pour into the atmosphere, where it traps heat and warms the planet. The result is a changing climate, but taking action now can still make a big difference, said Daniel Schrag, director of the Harvard University Center for the Environment. "We can't stop climate change, but we can stop climate change from being truly catastrophic," said Schrag, a panelist in a Saturday afternoon session that focused on the "wicked tradeoffs" that are inevitable in dealing with a warming planet. "There is a big difference between two degrees and four degrees or eight degrees," he said, referring to the increase in global average surface temperature expected under different emissions scenarios. "Adaptation is now upon us, and it will involve tradeoffs," said moderator Daniel Press, the Griswold Professor of Environmental Studies at UC Santa Cruz. For example, panelists discussed the growing competition for reduced water supplies, pitting cities against agricultural and environmental needs. That particular conflict has become familiar to Californians as the state enters its fourth year of drought. "We're already not in the climate we used to have," said panelist Noah Diffenbaugh, a Stanford University climate scientist who earned his Ph.D. at UC Santa Cruz. Diffenbaugh noted that drought is not just a result of reduced snow and rainfall. Historically, droughts have occurred when reduced precipitation coincides with unusually warm temperatures, whereas years with low precipitation and normal temperatures have not led to drought conditions. Now, however, consistently warmer temperatures mean that drought will occur whenever precipitation is low, he said. One area in which adaptation to climate change is likely to be especially painful is in coastal areas affected by sea level rise. This was the topic of a panel Saturday morning on "coastal resilience." Panelist Susanne Moser noted that some climate experts have worried that talking about adaptation to climate change may distract the public's attention from the central challenge of mitigating climate change by reducing greenhouse gas emissions. In her experience, however, confronting the details of what adaptation will require can help people realize the importance of taking steps now to address the causes of climate change. "Mitigation is so much easier than adaptation," Moser said. "I have found that having those conversations about adaptation actually strengthens people's motivation to address the roots of the problem." In some coastal regions, communities will be forced to retreat from the coast as a result of rising sea level and increasing damage from storms and flooding. The challenge is convincing owners of coastal properties of the need to plan for managed retreat from the coast. "We have had no success getting people on the oceanfront to move back," said panelist Rob Young, a coastal geologist at Western Carolina University. Too much effort is currently focused on protecting existing shorelines instead of allowing them to move as they would naturally, he said. "Coastal ecosystems are inherently resilient because they are naturally dynamic--they can move in response to sea level rise. The tricky part is to allow them to move while preserving communities," Young said. "This is the crux of the matter: the ecosystems have to move, and they are becoming diminished by efforts to hold them in place. Building marshes out into the bay, doing ecosystem restoration in place, is not a bad thing to do, but it is not a long-term solution. We have to change the map." According to Young, historical maps of the southeastern United States show that in the past, some coastal communities have either disappeared or moved inland in response to shifting shorelines. "Some of them picked up and moved the whole town," he said. "What's new is the idea of protecting communities in place at public expense." Part of the problem, Young and others said, is that policies such as disaster relief programs and insurance regulations create a system that protects many property owners from the true costs of building in risk-prone areas of the coast. "We have a system of private gains and externalized costs, so that the federal government pays for rebuilding the infrastructure for rich people's vacation homes," Young said. Many of the panelists touched on issues of fairness and the question of who should bear the costs of adapting to climate change. "We'll have plenty of unmanaged retreat, and it won't be fair," Moser said. "Retreat then becomes a class issue." Alley noted that, on a global scale, the countries most severely affected by climate change will be the underdeveloped countries that have contributed the least to the problem. Schrag added that climate change is also a matter of "intergenerational equity," because current generations that are enjoying cheap energy from fossil fuels are creating dire problems for future generations. Turning away from an energy system that has been successful and beneficial in so many ways, however, will not be easy. "The most difficult thing to tell people is that something they like to do has to end. It is no small challenge to communicate effectively the need to change," Moser said. Developing a new energy system that does not depend on fossil fuels is possible, according to Schrag, but it means rebuilding the energy infrastructure, which will take a long time. It will also require continued development and implementation of alternative energy technologies. Policies such as California's law to reduce greenhouse gas emissions (AB 32) are important not because of their impact on carbon emissions, Schrag said, but because they encourage the development and improvement of alternative technologies. "We need to keep advancing the technologies that are going to be disruptive," he said. Climate change remains a politically polarizing issue, but there is growing recognition of the need to address the problem, said panelist Kerry Emanuel, an atmospheric scientist at MIT. "The axis of the debate in this country is shifting from whether there is a problem to how do we deal with it," he said.